Well this is certainly a post I don’t mind writing out of order, even if I did mind I think I’d go ahead and post it anyway. Last night was a very special game, certainly special enough to warrant a break of the usual rules. 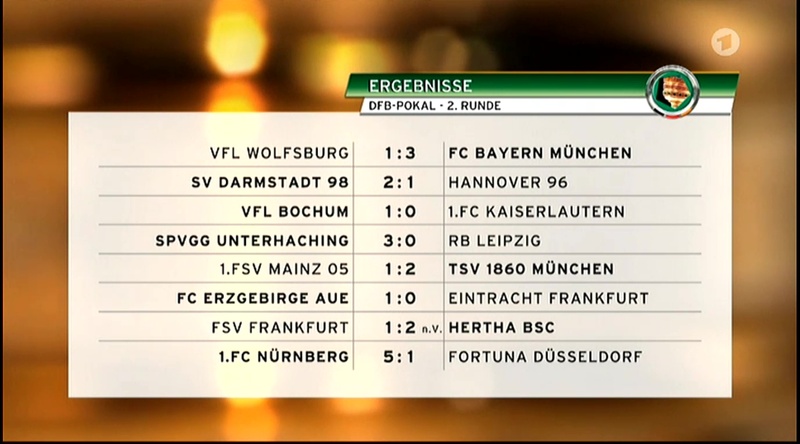 This weekend saw two matches between top placed teams, Dortmund v Bayern and last night Freiburg v Leipzig. In an interview at half time during Dortmund’s game Joachim Löw said it was so far the best game of the season he’d seen and he was probably right. 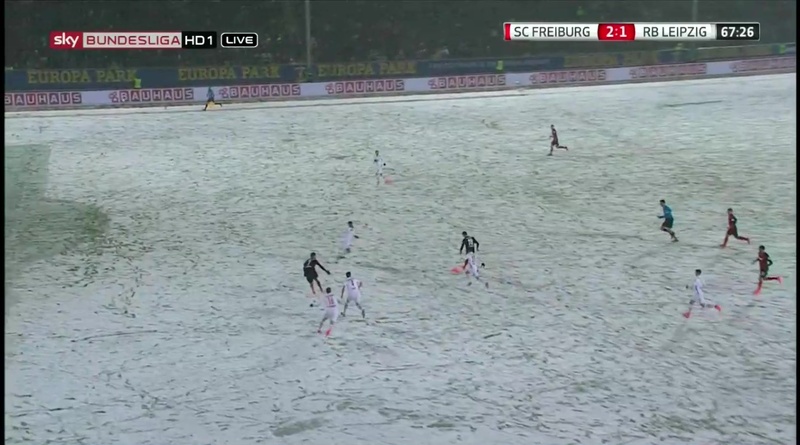 Freiburg’s game unfortunately did not meet those standards. 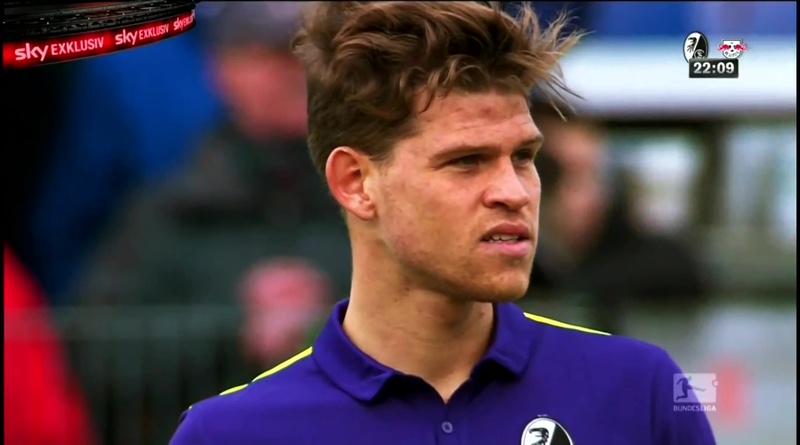 Their first encounter last year did with the first half being one of Freiburg’s standout performances this season. This encounter was prevented from being a similarly excellent affair by the weather. It’s most ironic for two reasons. Firstly because Freiburg is located in the state of Baden-Württemberg and is known for it’s terrific weather, in fact it enjoys the best weather of any city in Germany, averaging 1,740 hours of sunshine a year. 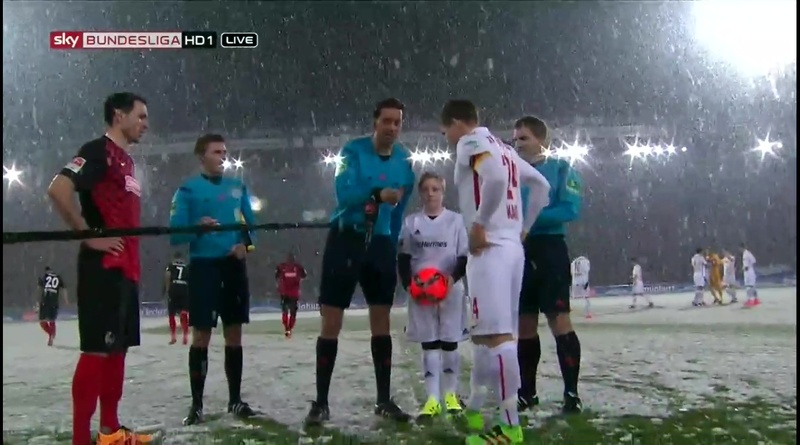 Secondly because just last week I was thinking of writing a snow related Jogi & Hansi story, inspired by hearing Amir Abrashi talking about the possibility of snow for last week’s game. 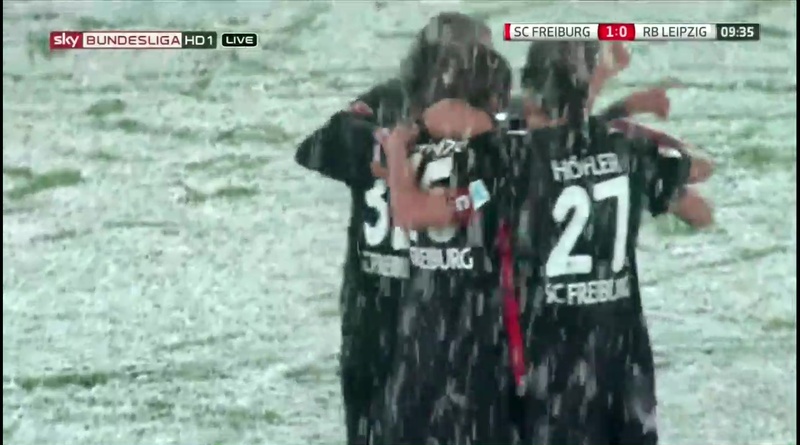 The snow however whilst making life difficult for Freiburg did not prevent them from taking all three points and providing plenty of fun along the way. 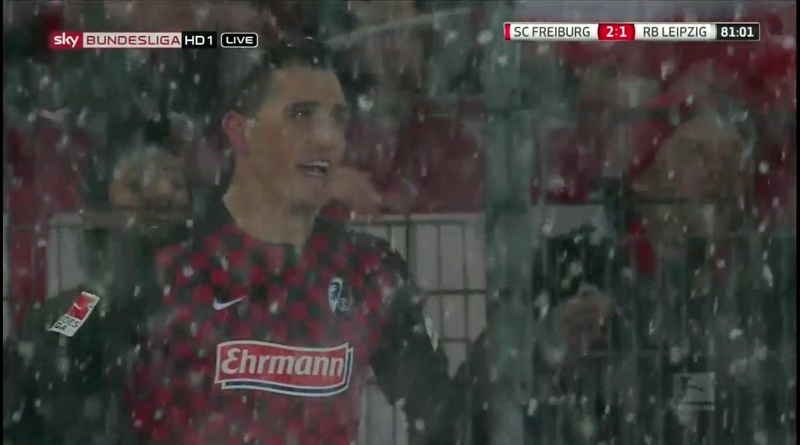 The commentator pointed out the similarity between this game and Freiburg’s last home game in the Bundesliga against Bayern. 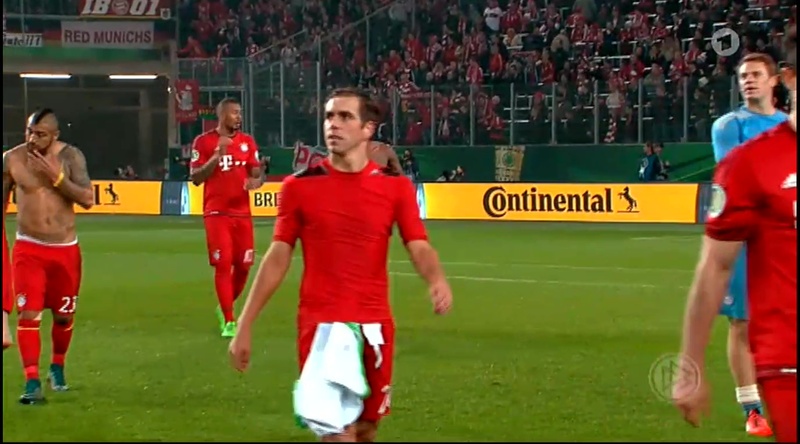 That was also a very close game, it too finished 2-1 and Nils Petersen played an important part in the game. Once more he was the joker, though last night in a less direct way. He provided the assist rather than scoring the winning goal himself. Of course the weather was a lot better that day as well, being a typically sunny day in Freiburg. It’s very amusing to hear the fans singing the official club song at the end of the game, the reason being part of the song is about the sun shining. Well I guess in a way it is. 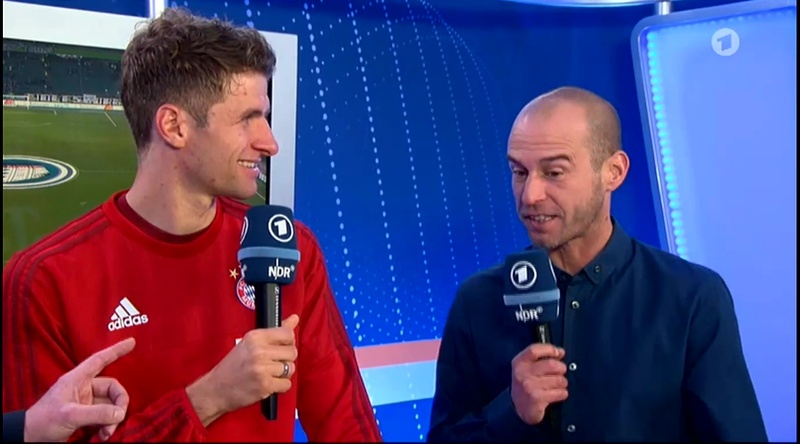 It’s very curious indeed, the gap at the top of the Bundesliga is cut to five points after Dortmund drew with Bayern, meaning technically the title race is back on. 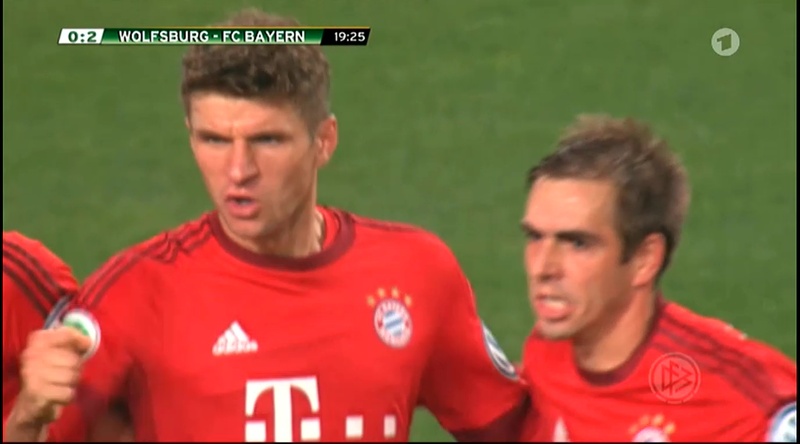 Of course some people think Bayern still have it all wrapped up. 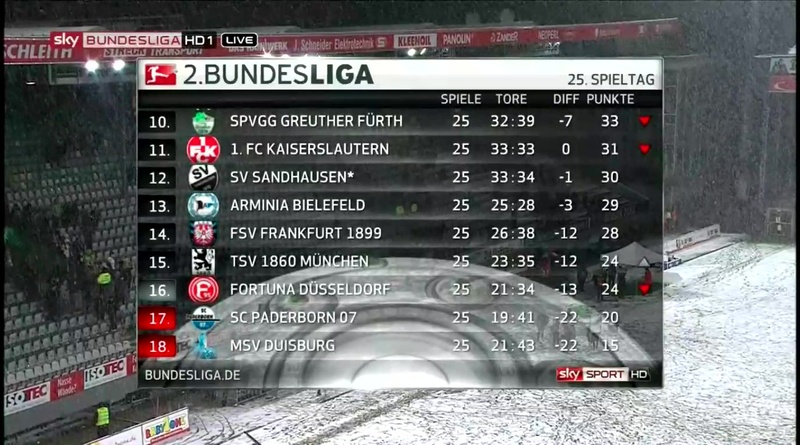 That’s definitely not the case in the 2.Bundesliga because with nine games left the gap is cut to three points. 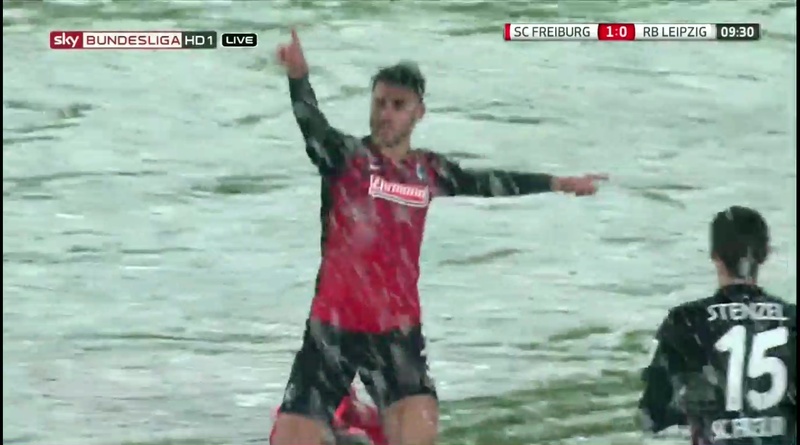 Just three points now separate Freiburg from league leaders Leipzig. Not only is automatic promotion a very real possibility but first place is still on the table. I would love for them to win the league, there’s no point in lying about it. But I’d be happy with first or second, as long as it’s an automatic promotion place then I’m happy. 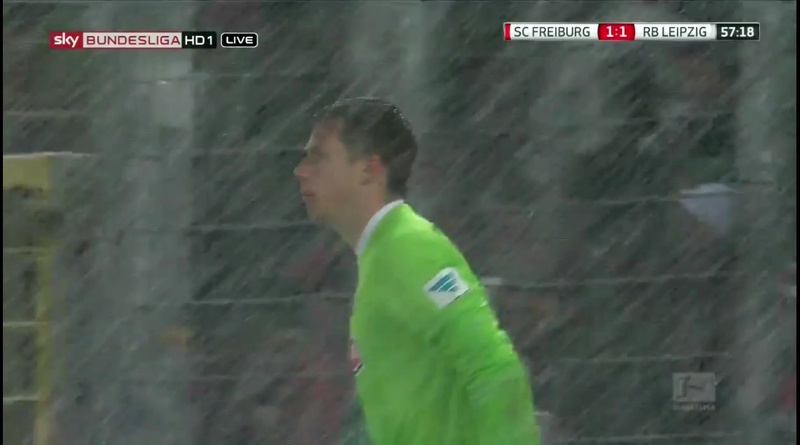 As well as being similar in terms of importance Freiburg’s game had something else in common with Dortmund’s. Roman Bürki after being humiliated in the reverse of the fixture would have been keen to put the record straight on Saturday. 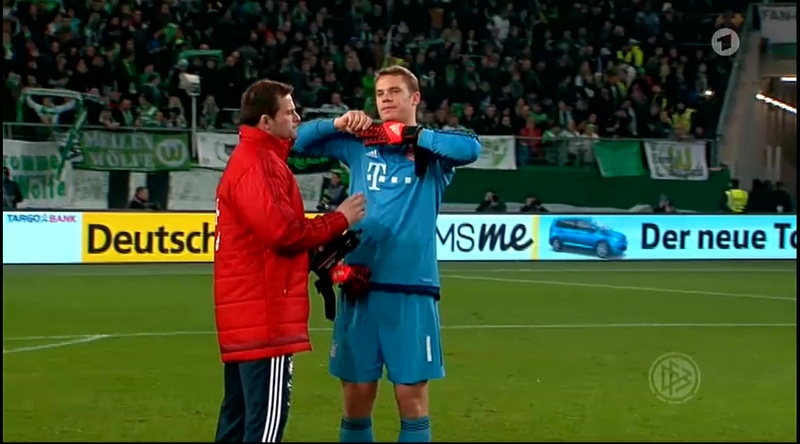 He did eventually do that, making a number of important saves, though only after getting off to shaky start and almost gifting Thomas Müller goal. 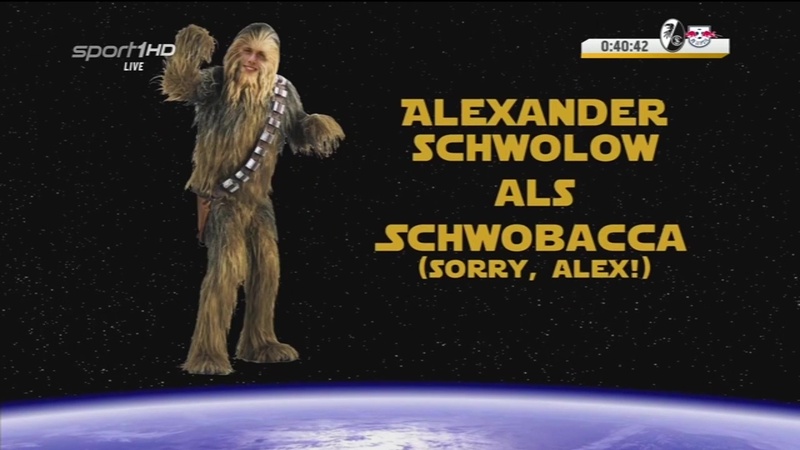 Alexander Schwolow did not get humiliated against RB Leipzig last year, but he does kind of have a point to prove. 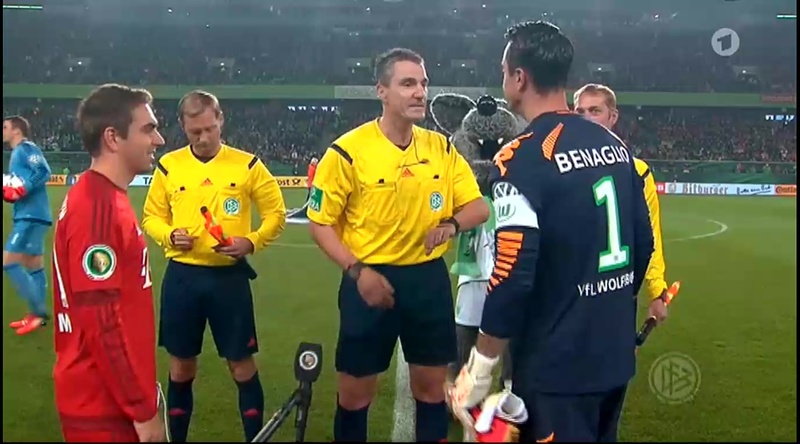 Filling Bürki’s shoes is a tall order, simply because he has not even a tenth of his experience having spent last season playing in the third tier with Arminia Bielefeld. Yet he’s well on the way to doing so. I never thought I’d be able to say I’m ok with Bürki having left, but now I can say just that and it’s true. 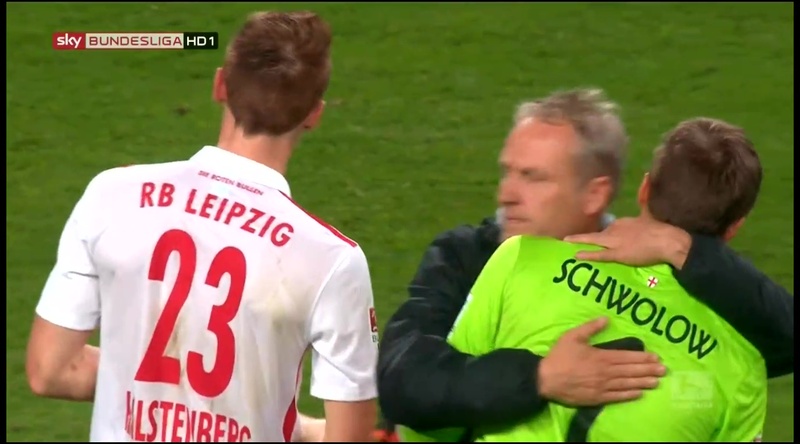 Schwolow’s played well for the better part of the season but last night was something else entirely. 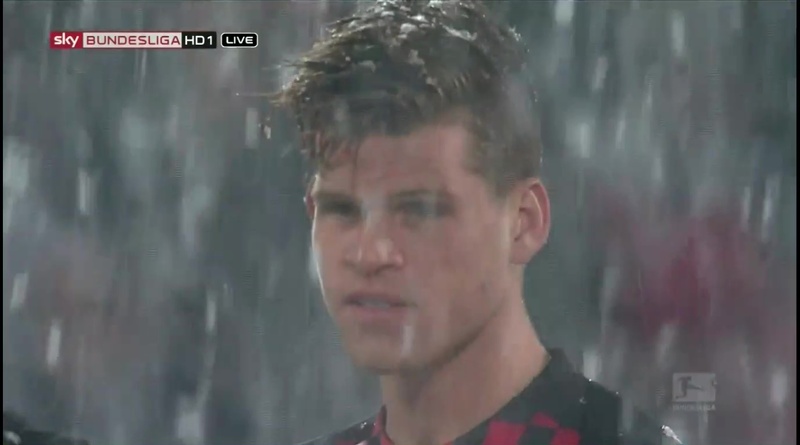 In the dying minutes of the game he provided a save which as well as being world class also kept Freiburg in the game. With that one save he helped provide three vital points which could turn out to be the difference between getting promoted or not. 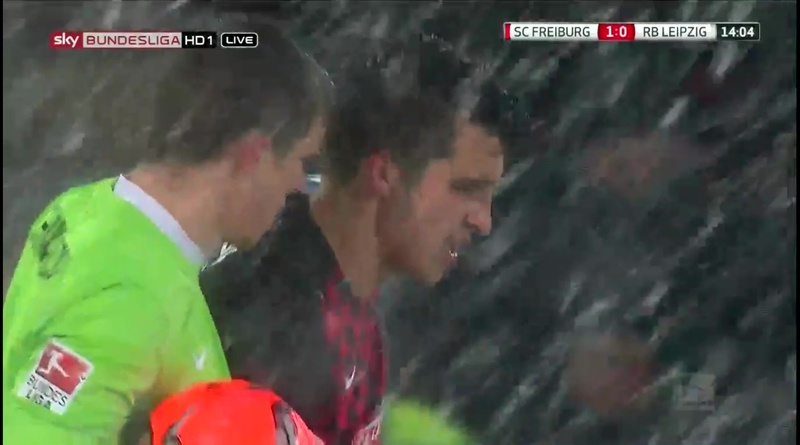 Bürki despite being excellent all season could not prevent Freiburg from getting relegated, but Schwolow may just yet help them get promoted. It wasn’t a game I expected to be particularly easy, even without the inclement weather. The last time they met was a tough battle with Freiburg running out of steam in the second half and having to resort to just doing all they could to keeping Leipzig from taking the lead. Leipzig equalised just after the start of the second half and never stopped looking dangerous for the rest of the game. It was almost a pattern that was repeated last night. 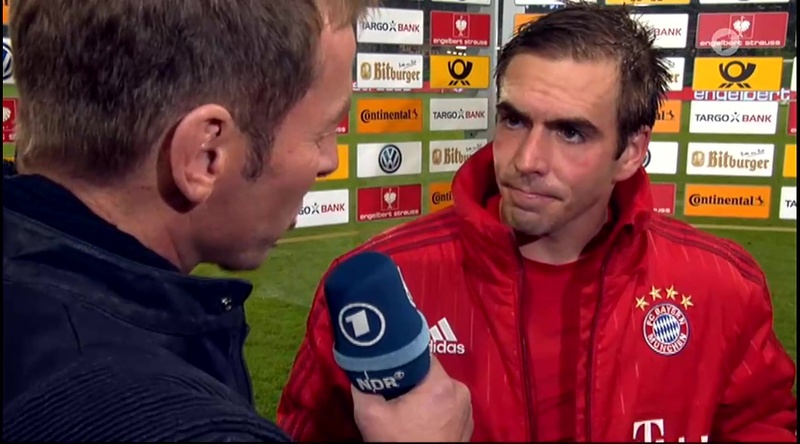 Thankfully Nils Petersen had a thing or two to say about that. 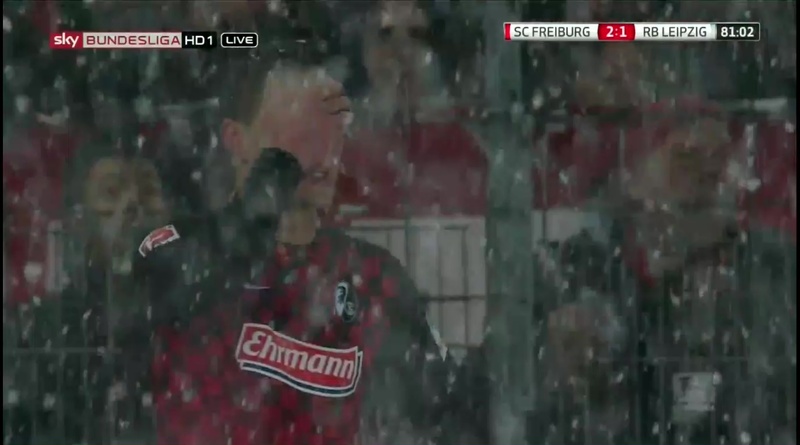 Other than the weather there was another surprise for last night’s game with Christian Streich making just one change and that was a forced one. 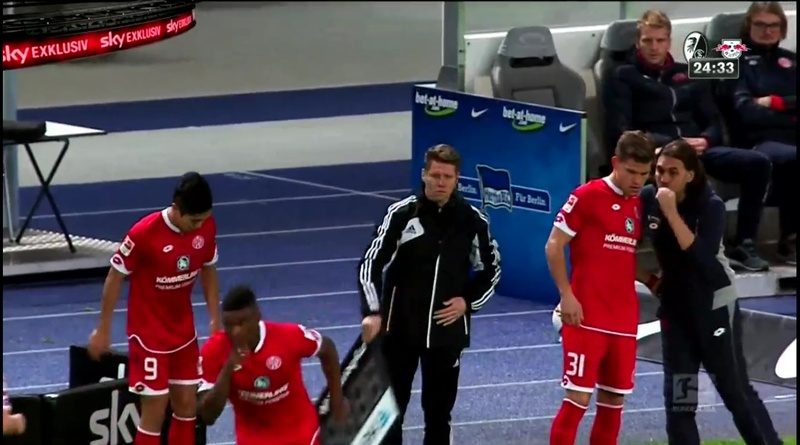 The injury to Marc Torrejon on Wednesday afternoon meaning Immanuel Höhn took his place in the center of defence alongside Marc-Oliver Kempf. 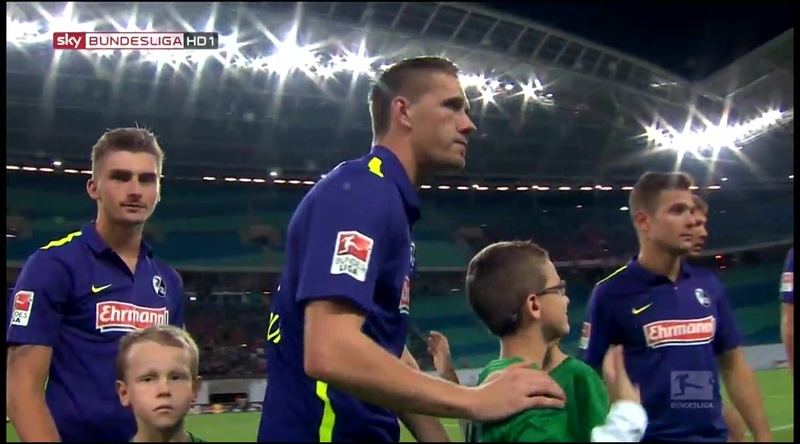 Petersen meanwhile how scored the all important goal against Leipzig on MD8 found himself on the bench, displaced by the newfound strike partnership of Florian Niederlechner and Karim Guede. The opening few minutes of the game were as you would expect, lots of misplaced passes because of the snow and possession changing hands fairly quickly. Leipzig got their first shot on goal before barely a minute had been played but it turned out to be an exceedingly tame shot and was picked up easily by Schwolow. The first few minutes it was all Leipzig because whilst the possession was fairly balanced Leipizg had all the chances. 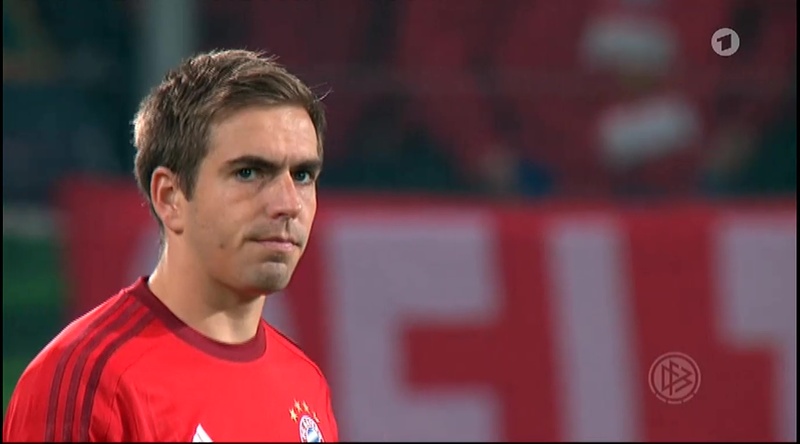 Poulsen in particular looking a real threat and getting two chances in a matter of minutes. Both times the defence dealt with it, Abrashi the first time seeing it out for a corner and Pascal Stenzl dispossessing Poulsen the second. 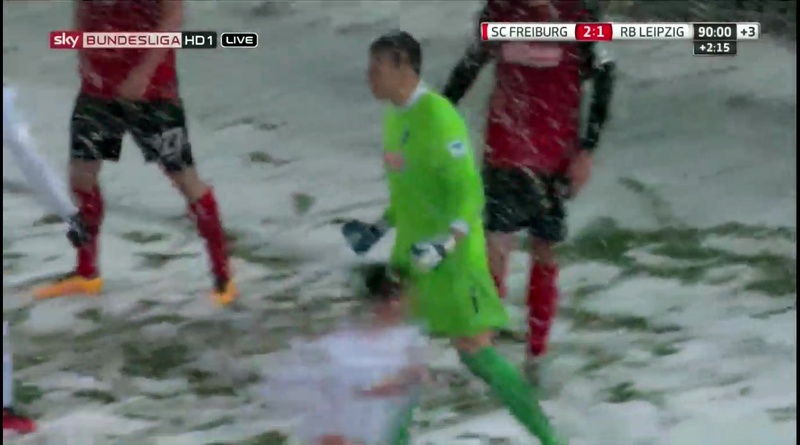 Freiburg’s first attempt at an attack turned out to be nothing of the sort. Mike Frantz making the run but ending up on the floor, claiming he was elbowed in the back. The replay showed some contact but probably not enough to bring him down. 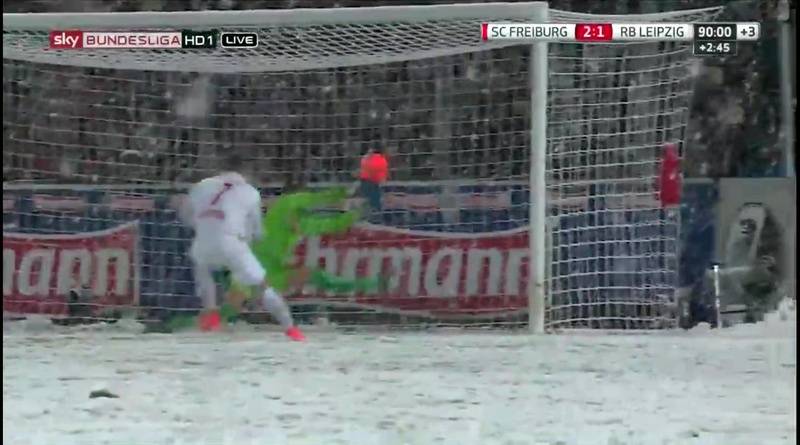 And that was the only time Freiburg got close to goal in the first eight minutes. 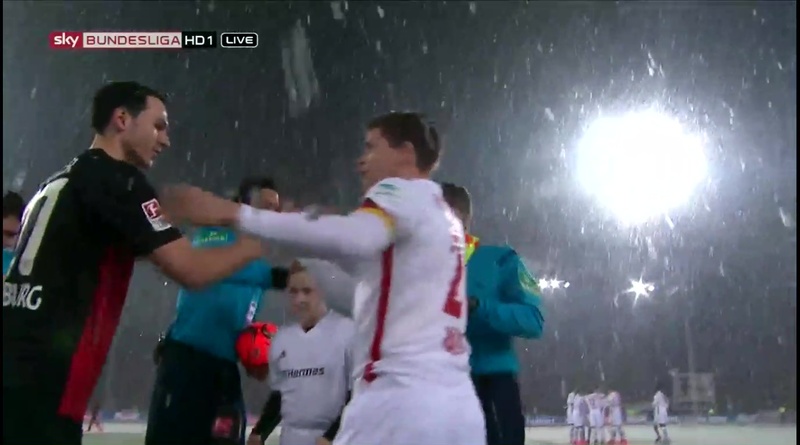 The action resumed with Leipzig wasting no time in getting up-field and threatening once again. 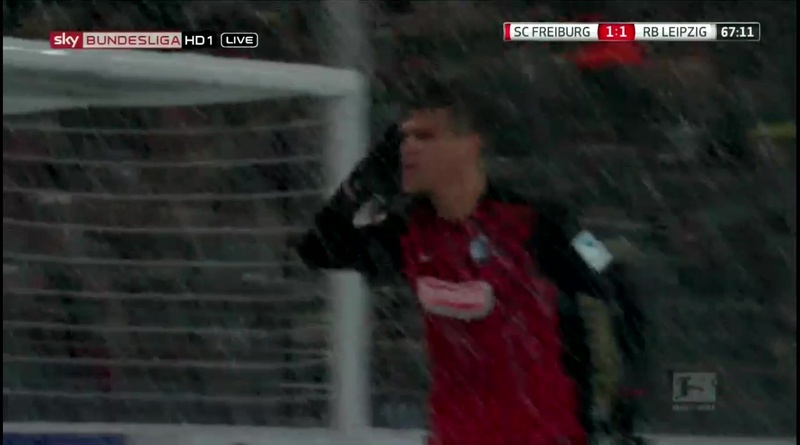 As it turns out Freiburg’s first shot on goal was to be their first goal. It started out with an easy save by Schwolow, he then kicked it up-field whereupon a Leipzig player tried and failed to control it. Niederlechner helped himself to the ball and made the pass to Frantz who in turn set up the arriving Grifo for his 11th goal of the season. Grifo’s celebration was great but Schwolow’s was better. I find it funny they were at opposite ends of the pitch yet ended up celebrating in the exact same way, I don’t know if Schowlow saw Grifo sliding and thought he’d join in as well or if it’s just coincidence. Either way it was cool. 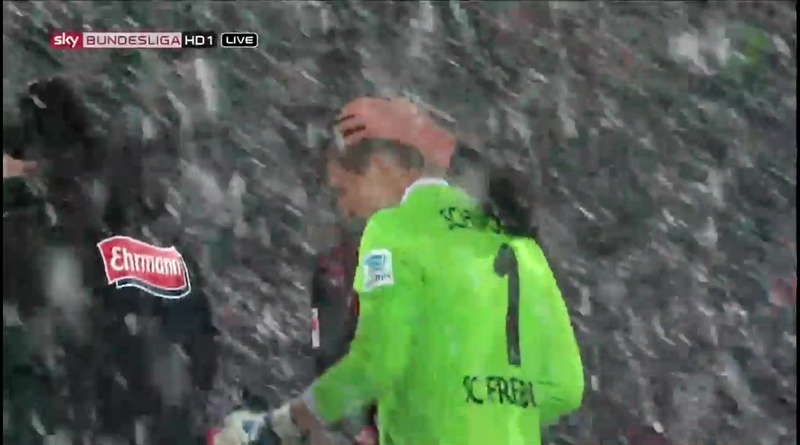 Freiburg 1 Leipzig 0. It took just nine minutes and twenty seven seconds for them to take the lead. 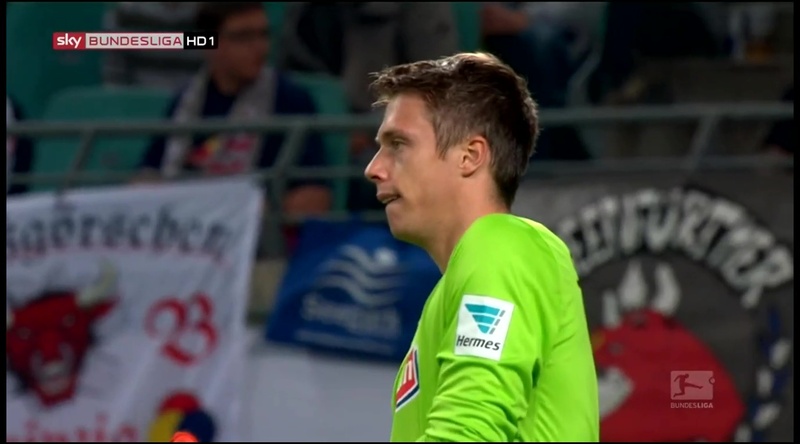 Despite Leipzig’s attacking threat Schwolow had few difficult saves to make in the first twenty odd minutes of the game. But he was the busier of the two keepers despite making few noteworthy saves in the first half. 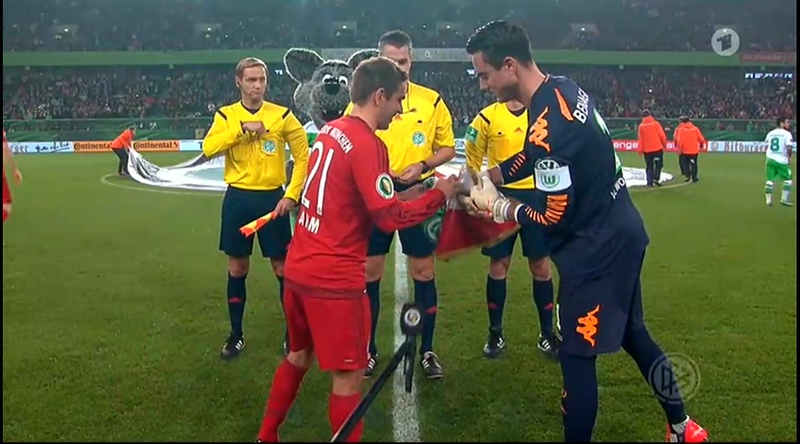 As you’d expect Leipzig continued to dominate in terms of possession but were so far unable to make this count. 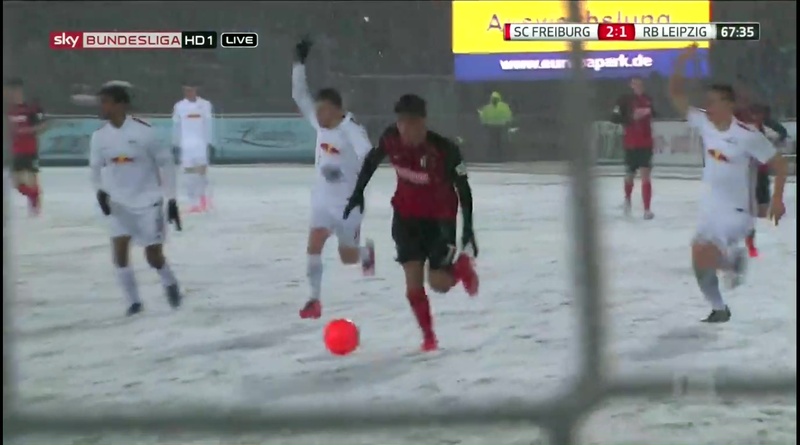 Misplaced passes due to the snow covered surface continued to be a common feature, as did defensive errors on Freiburg’s part. Then in the 31st minute there was something which is not so common an occurrence, a time out for snow shoveling. 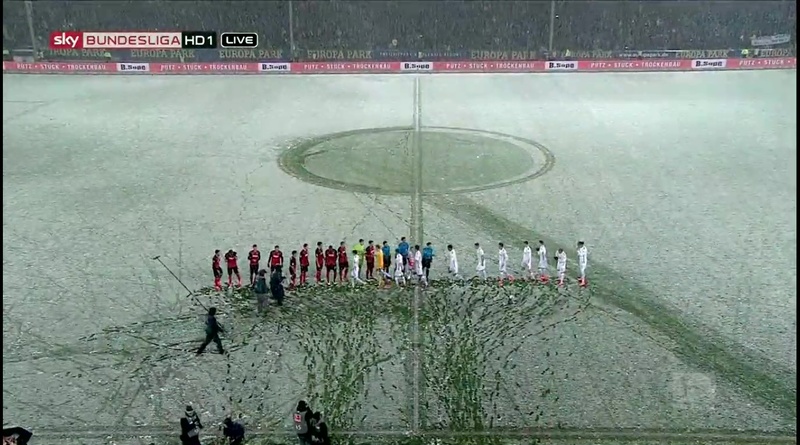 The referee calling a halt to play because the lines of the box were no longer visible. Play resumed about three minutes later with the time to be added on. 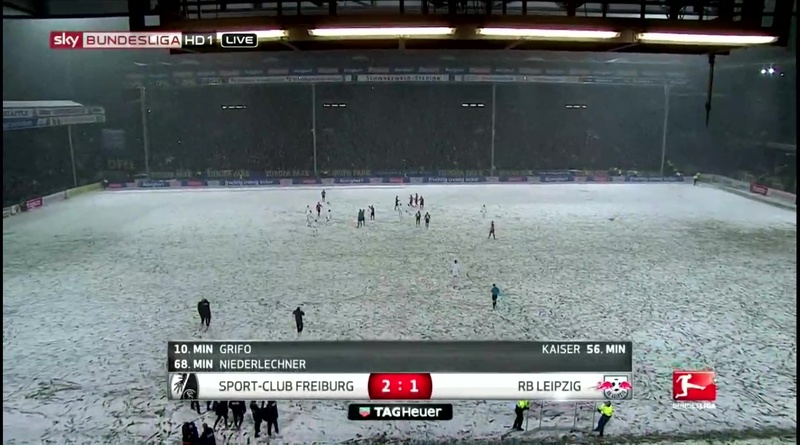 There is one good thing about the snow, Leipzig not being able to run Freiburg ragged quite as effectively as they did last time. 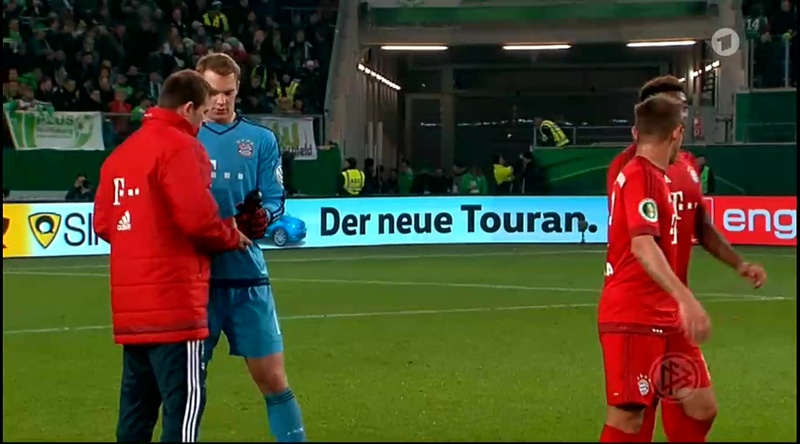 In the 40th minute the first yellow card of the game was handed out to Yussuf Poulsen for clashing into Amir Abrashi, the latter looking a little confused as he was picked up off the floor. But luckily he was able to continue. The subsequent free kick was of course taken by Grifo but it was saved by the keeper. 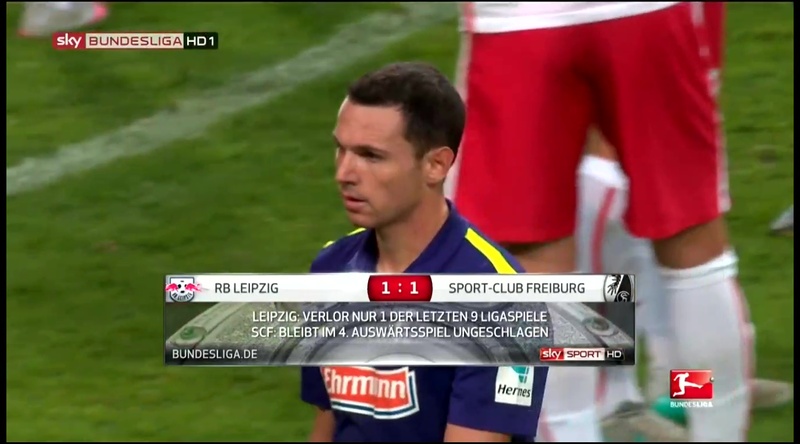 At the end of the first half Freiburg were still one up, for the time having managed to hold off Leipzig. At the start of the second half both teams made just the one change with Freiburg taking off Karim Geude and replacing him with Maximilian Philipp. Both teams came out ready for battle in the second half, neither of them lacking in energy despite the intensity of the first half. At first it seemed my initial fears were unfounded, that they’d concede an equaliser in the same circumstances as last time. I was wrong on that count unfortunately. Niederlechner in particular continued to be outstanding, winning the ball back in dangerous places and very much remaining an attacking threat. 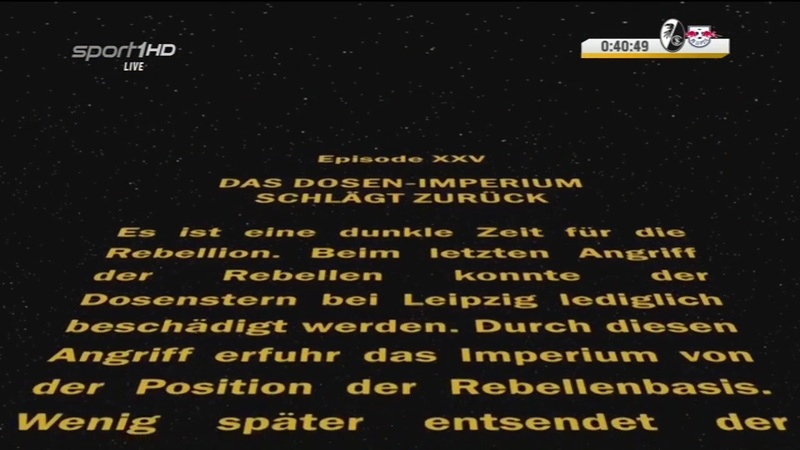 Leipzig on the other hand whilst causing plenty of problems still weren’t giving Schwolow much hard work to do. That is until the 55th minute when they caught him and Marc-Oliver Kempf by surprise. What’s not a surprise is that Yussuf Poulsen had something to do with it, you’d have put money on that. 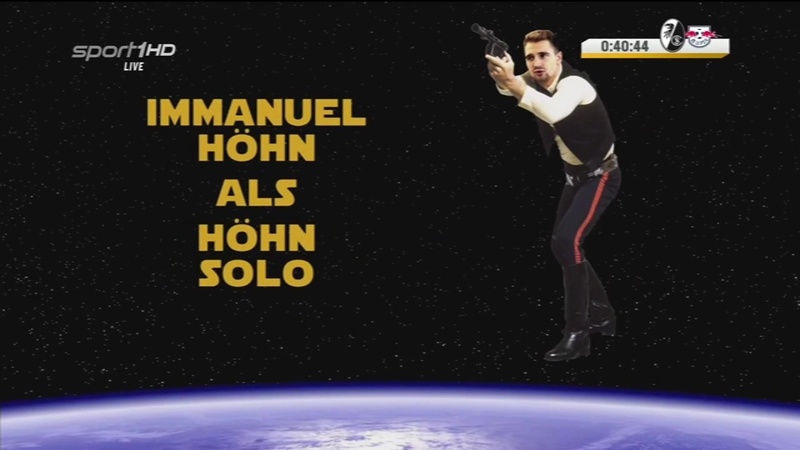 It was his initial pass into the box which resulted in the goal by Kaiser. 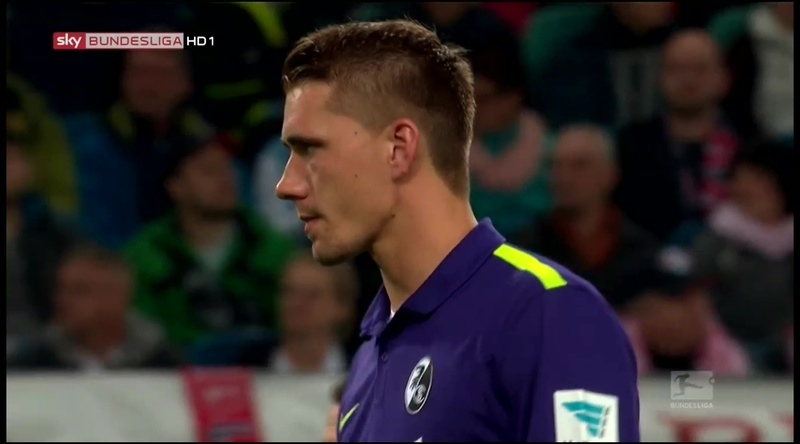 Kempf was there but not close enough, no-one picked Kaiser up. From this point on it seemed like the game was going to go as the last one did. 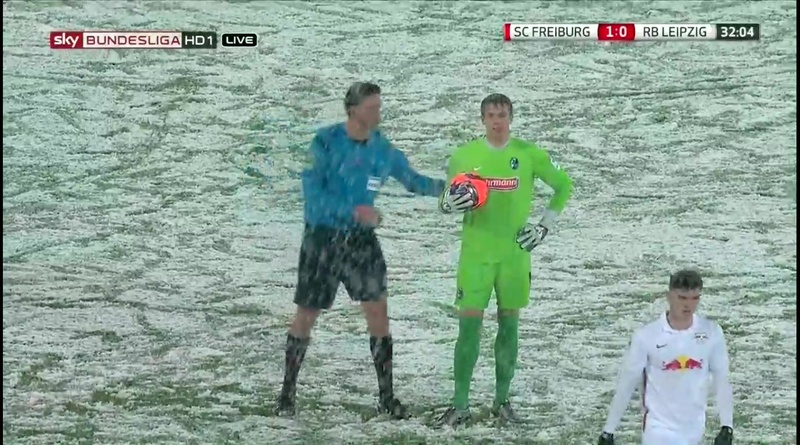 Freiburg just doing their best to hang on for the point. 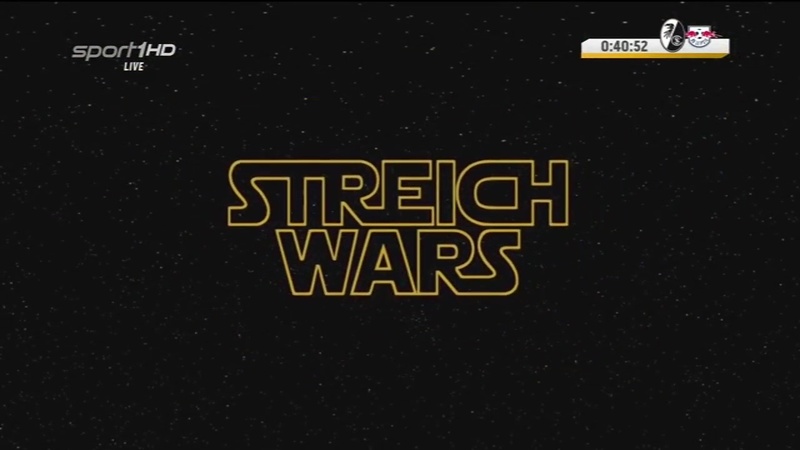 Good thing Streich had an ace up his sleeve in the form of Petersen. 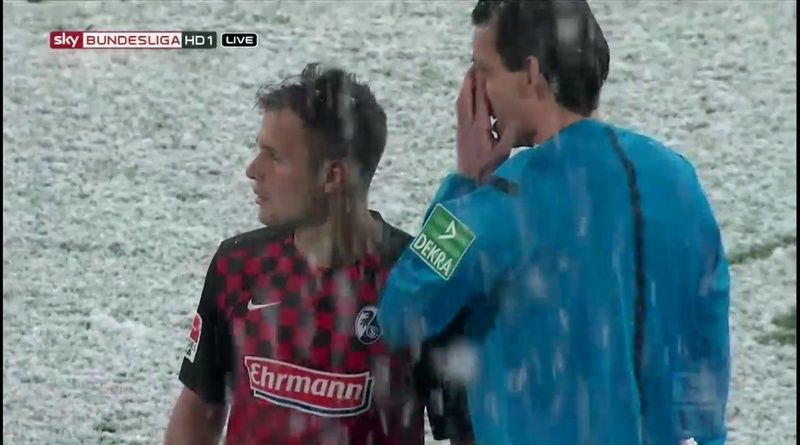 Ten minutes after they conceded the equaliser Freiburg brought on Petersen to replace Frantz, the idea probably being for him to take over Niederlechener’s position up front and for him to fill Frantz’s space. That’s not quite how it turned out. For once Petersen got to be the man providing the assist instead of scoring the goal himself. A game changer indeed, just one minute after he came on the goal was scored. 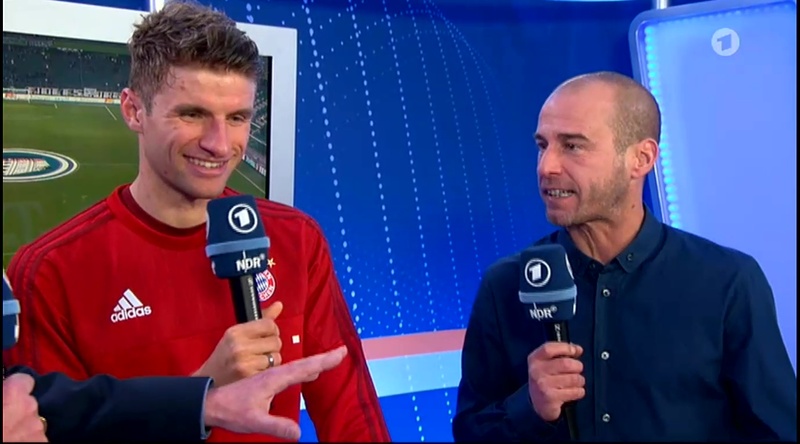 It was him and Niederlechner working together all the way, they were the only two players up there. Niederlechner headed the long pass so it fell for Petersen, he then made the well timed pass and Niederlechner skipped past the unsuspecting defenders, went one on one with the keeper and scored. All the defenders protested for offside but it wasn’t given, they were all caught napping, all four of them that were there. It wasn’t only Petersen’s first real involvement in the game but was actually his first touch of the ball. 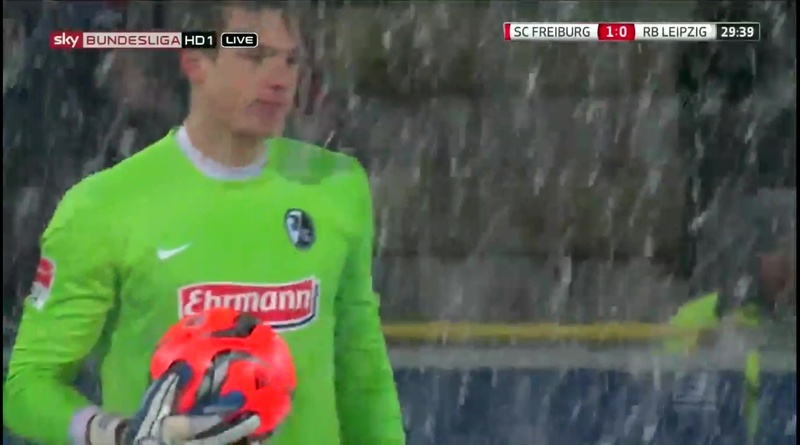 Thanks to Schwolow it stayed 2-1 and that makes four victories in a row for Freiburg. They face Frankfurt next which on paper at least should not be a game which causes them any problems. Leipzig probably have the tougher task, they host 1860 München who have pulled off some pretty good results in the past few weeks. Forget about them losing, all that’s needed is for them to draw with 1860, 1.FCN or perhaps Bochum and for Freiburg not to drop any points. 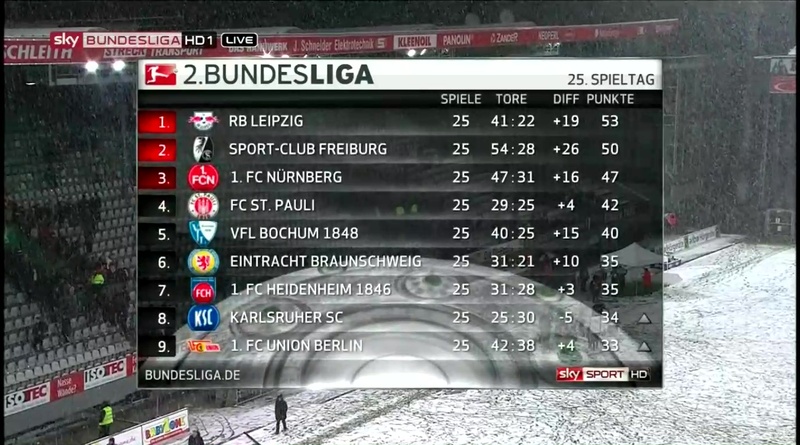 That’s all it would take for Freiburg to take the top spot again. But 1.FCN are still close behind, just three points behind in fact. 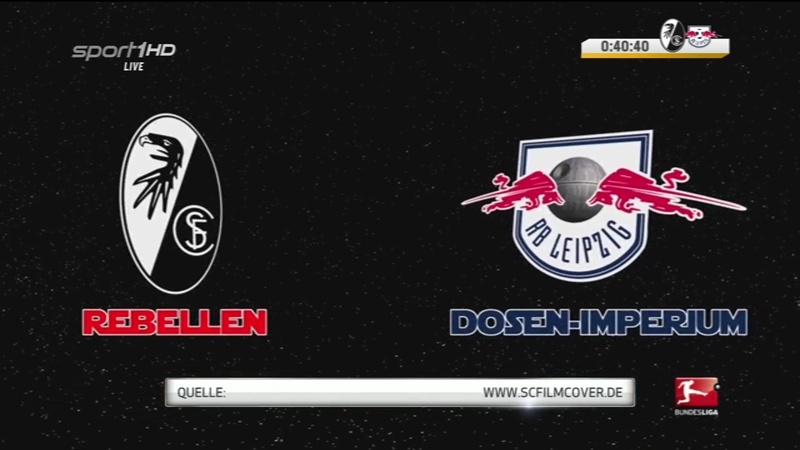 MD27 has two important clashes, on the Sunday Leipzig play 1.FCN and then on Monday Freiburg play KSC. They’re all must win games but that one in particular. 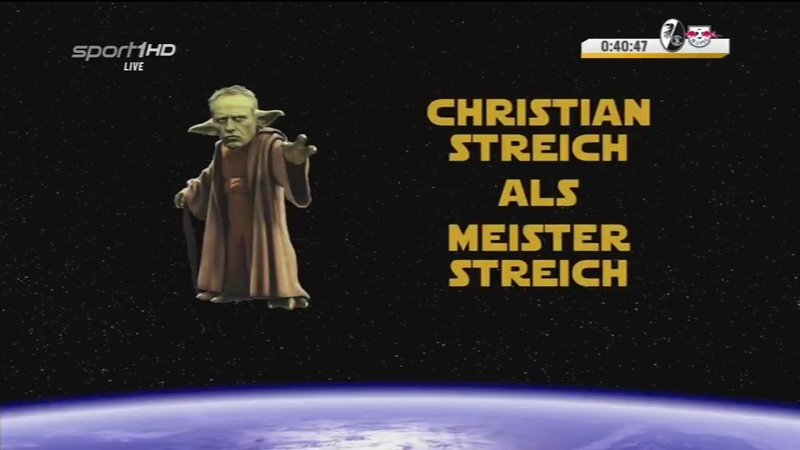 Freiburg’s victory was not the only interesting result this weekend. 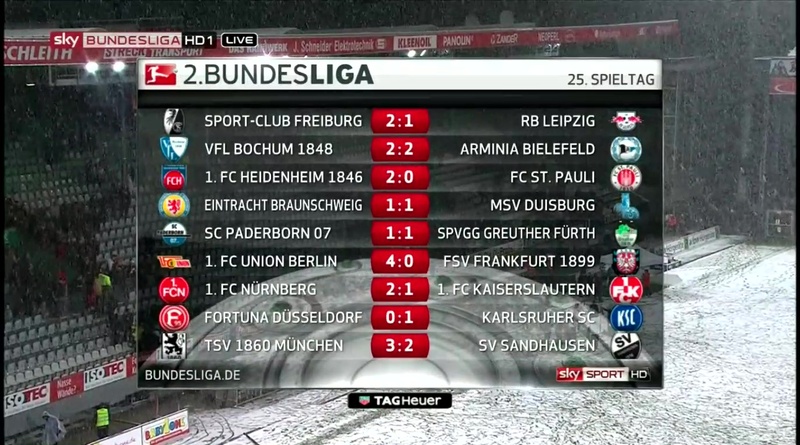 Both Bochum and St Pauli dropped points, the former drawing 2-2 with Bielefeld thanks to a last minute penalty and Pauli surprisingly losing to Heidenheim. 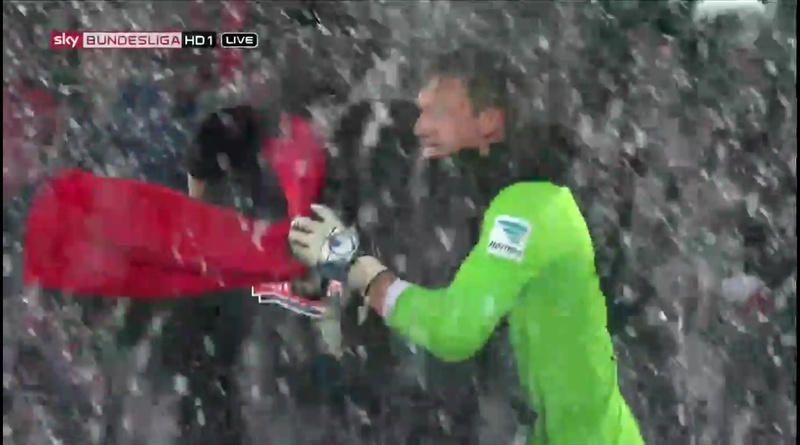 How ironic that is, Niederlechner’s former team lending a helping hand. 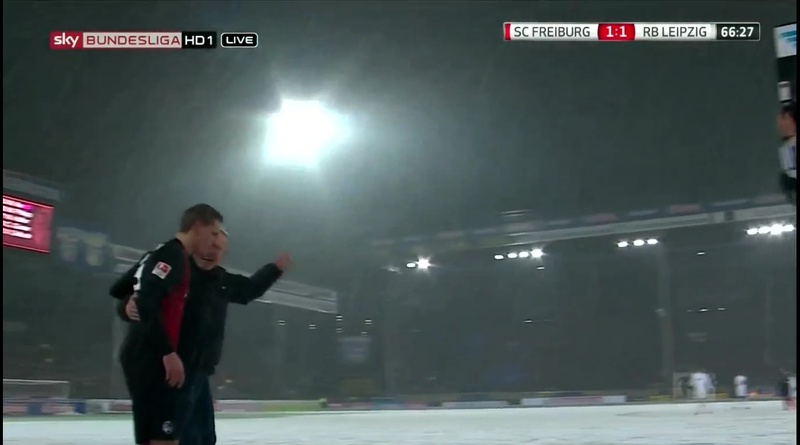 Paderborn after having sacked Stefan Effenberg got a very credible draw against Greuther Fürth but of course a point is not enough for them. 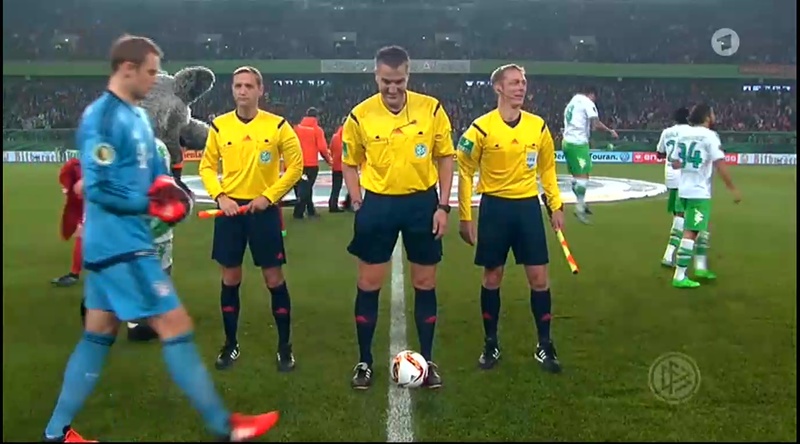 Round two of the DFB Pokal, the biggest game of this round obviously being Wolfsburg v Bayern. 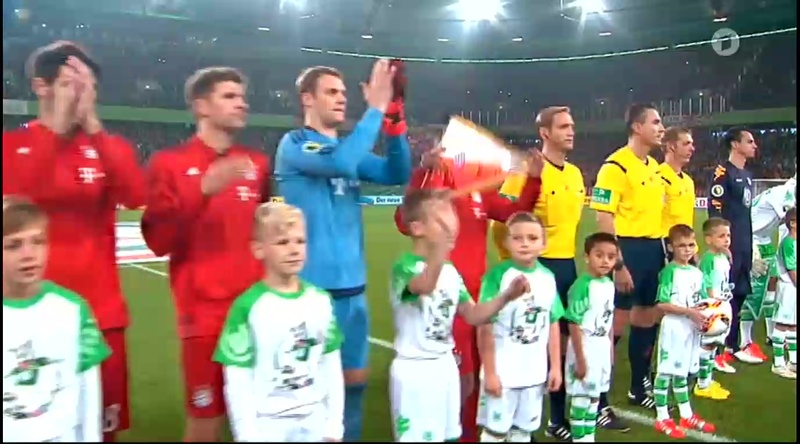 Last season’s winner of the Pokal (and the Super Cup) against the league winners. 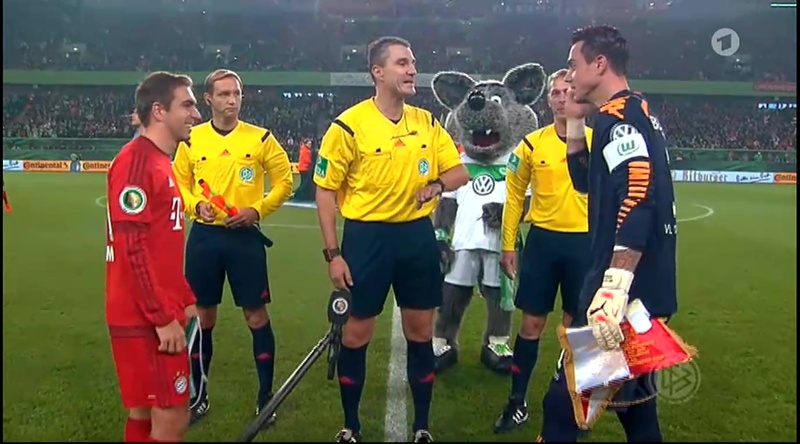 There were no surprises, Wolfsburg being outclassed by Bayern once more. It took them a little over three minutes for them to put the game to bed. 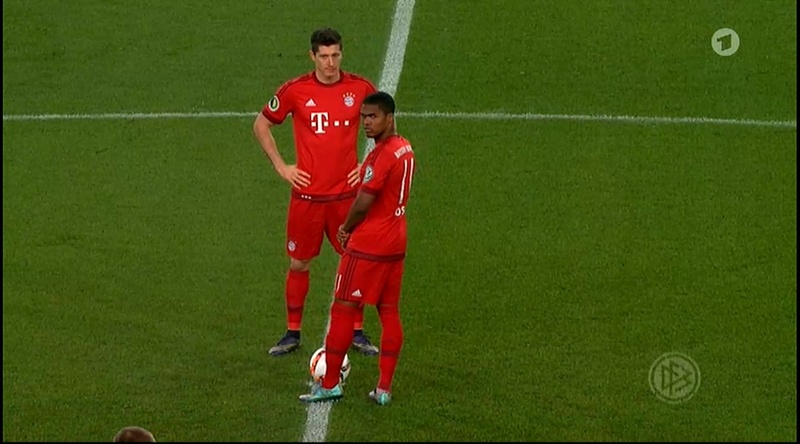 It wasn’t however the Robert Lewandowski show this time round, instead the goals were scored by Douglas Costa and Thomas Müller. Whilst there were no surprises in Wolfsburg there were some elsewhere. 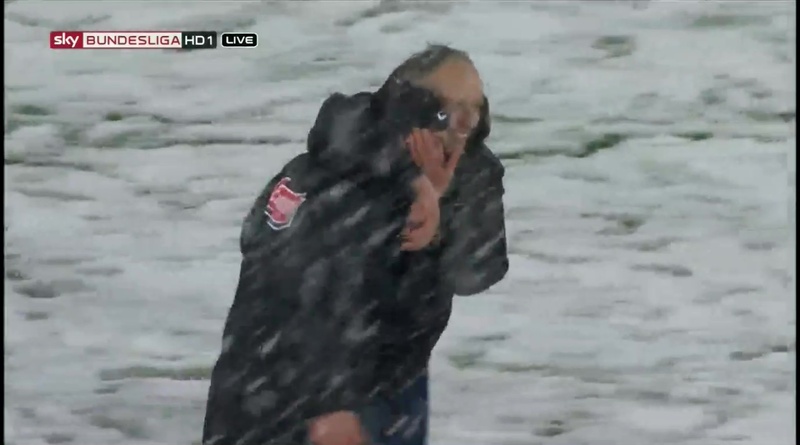 Unterhaching after knocking out newly promoted Bundesliga side Ingolstadt in the first round, continued their cup run by surprisingly beating 2.B side RB Leipzig 3-0. 1860 München are also still in the competition after beating Mainz 2-1. 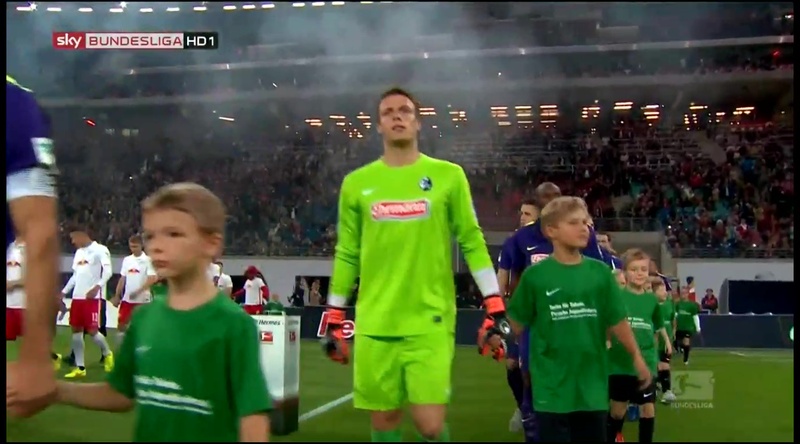 One big surprise of the evening was Eintracht Frankfurt losing 1-0 to Erzgebirge Aue. 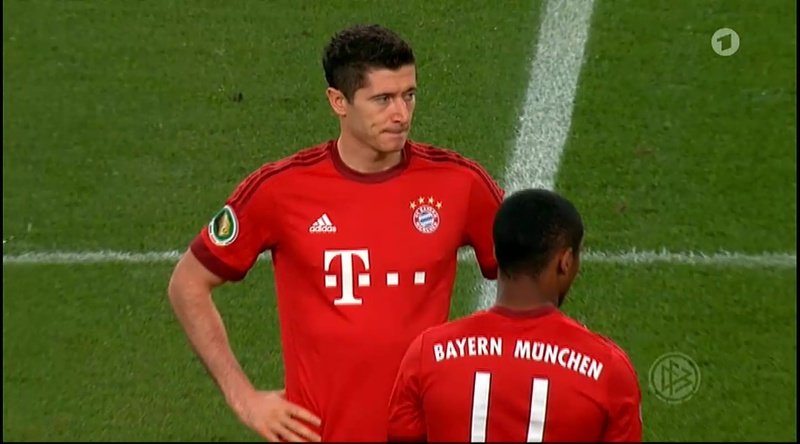 Even more surprising considering that they drew 0-0 to Bayern tonight. Consistency really isn’t their thing. That draw with Bayern is even more surprising when you take into account their woeful defensive record. One result I’m exceptionally pleased with is newly promoted Darmstadt triumphing over Hannover 96 2-1. Match-day 8 saw Freiburg visit Leipzig, playing in the same stadium and city that Germany would end their European qualifying campaign two weeks later. 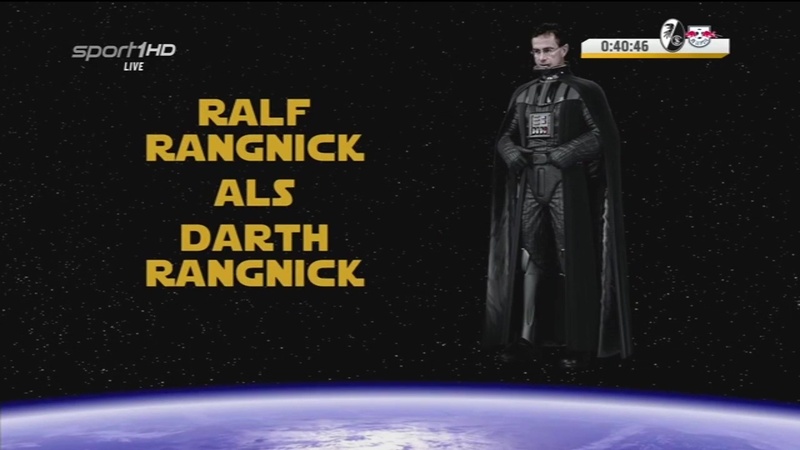 It was the game of the week of “die englische Woche” and it did not disappoint. The main advantage of this fact being that the game was played on Thursday, meaning all the other games had been played and there was no waiting around to see how other results would affect Freiburg’s standing. Going into this game Bochum were top of the table with seventeen points and Freiburg were in second with sixteen. Both teams went into their games on the back of a draw, the previous weekend Freiburg drew 2-2 at home with Bielefeld and Bochum 1-1 with Fortuna Düsseldorf. As luck had it Bochum continued their run of draws, racking up their third in a row, meaning if Freiburg beat Leipzig they would go top of the table for the international break. It was all so perfect, but it didn’t work out that way. 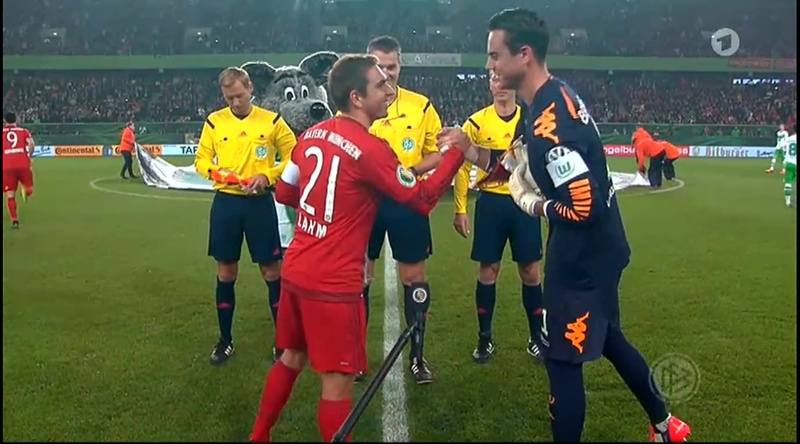 A trip to Leipzig was always going to be a difficult game, the most expensive team in the league against the youngest. It would have been extremely nice to come away with all three points and to spend the international break at the top of the table, but it would be wrong to be unhappy with only getting a point. It is a terrific result, they were never going to be able to continue playing with the same energy and tempo they did in the first half. Keeping that up would have been impossible and would only have led to making even more mistakes. I don’t like having to play for a draw but anything else would have been reckless. It was a classic game of two halves, the first belonged to Freiburg and based solely on that, they deserved the three points. They played Leipzig at their own game, pressing them constantly, winning the ball back quickly, being extremely offensively minded. 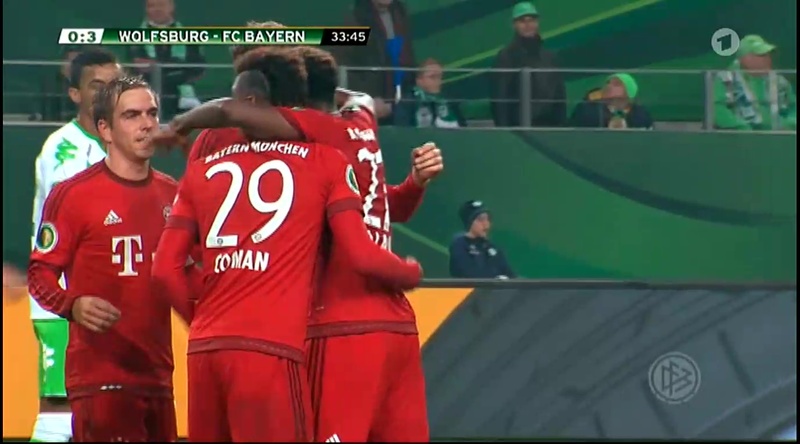 They turned in a great performance for the first 45 minutes with Nils Petersen scoring his goal in the 29th minute. It was a classic Petersen goal, originating from a wonderfully precise pass from Christian Günter to Petersen himself who laid it off for Guede. He in turn passed to Phillipp who spots Petersen in plenty of space in the left hand side of the box. 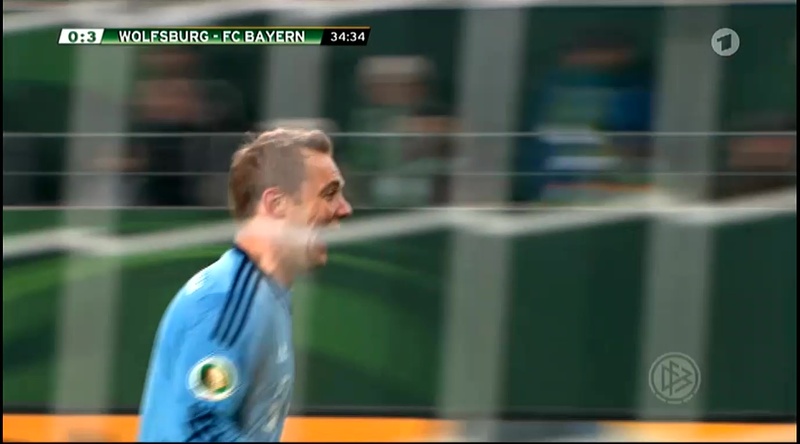 Petersen stays cool as always and puts it past the keeper. Leipzig got caught out, they only had two men back, the rest were on their way but couldn’t get their in time. No doubt being run ragged for the past 20 odd minutes had something to do with that. 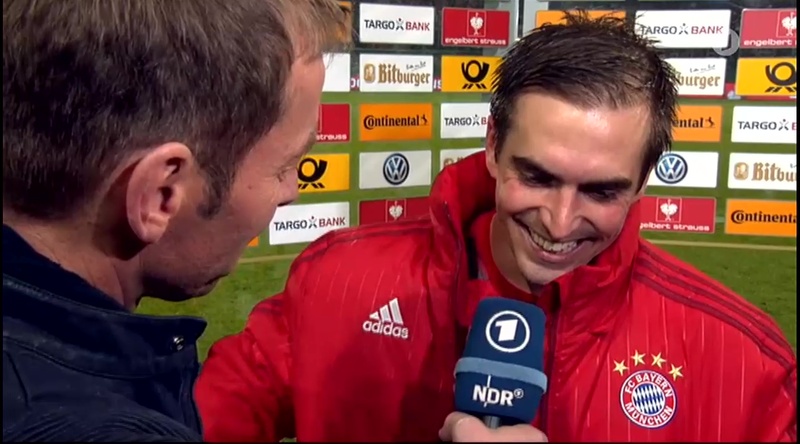 21 games played for Nils Petersen and 20 goals scored. 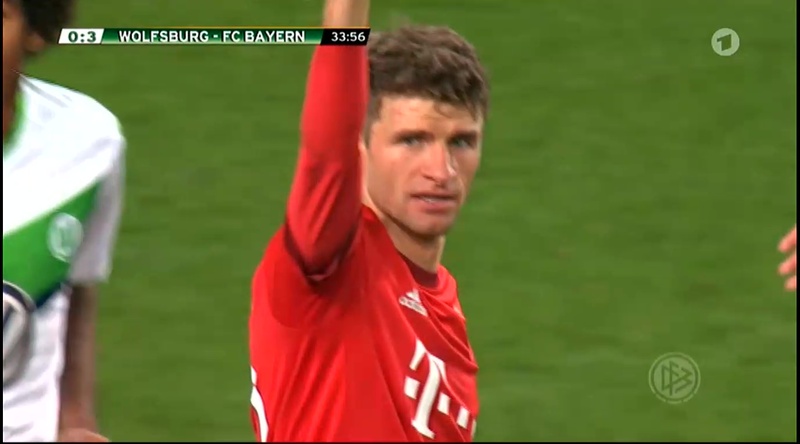 He is in the words of the commentator, the Robert Lewandowksi of the 2.Bundesliga. I don’t care for such comparisons, not because I don’t like Lewandowksi, I do like him very much and I consider the comparison a great honour to be bestowed upon Petersen. It’s just that Petersen is well, Petersen. I don’t need or want to compare him to anyone else. 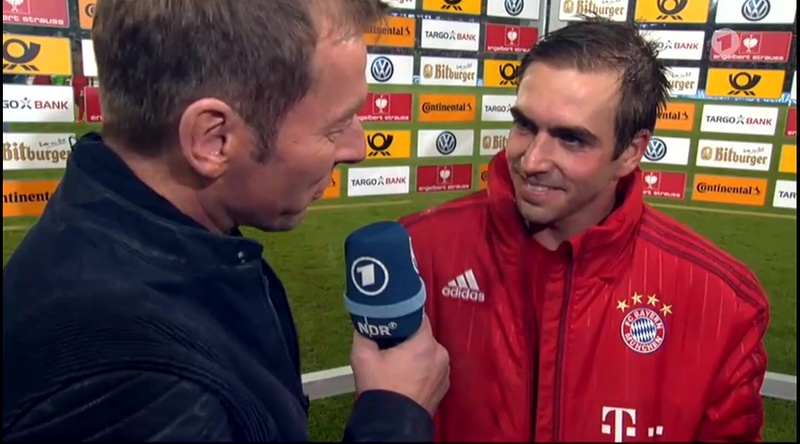 He’s not a bargain basement Lewandowski, he’s Nils Petersen. He was outstanding in the first half, as was almost all of the team. 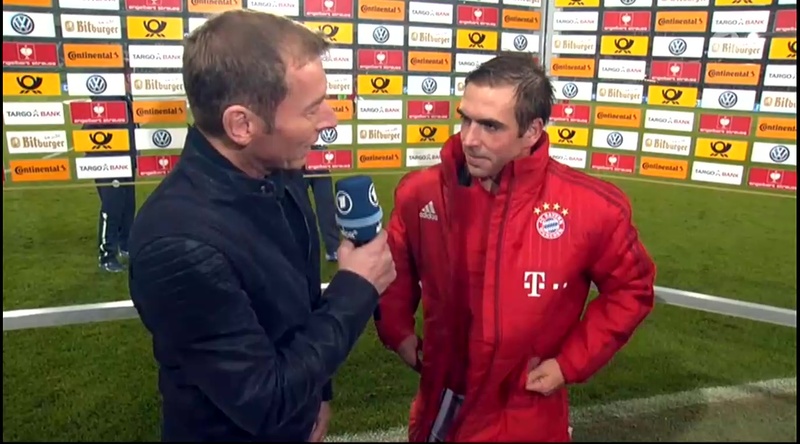 Alexander Schwolow continued with his excellent performance from the Bielefeld game. There was a few moments when he looked a little shaky, but he was excellent for the most part making some very important saves and in the second half he is a large part of the reason they have a point to take home. A bit of luck was involved getting that point I must admit, towards the end of the first half Leipzig had a goal ruled off-side when in all probability that decision was incorrect. I’m kind of glad in one way, not because that goal may have been the difference between getting a point or not but for Alexander Schwolow’s sake. It was not his finest hour. The corner was no problem, it was headed out, though straight to a Leipzig player who took a shot. Said shot took a deflection and hit the post. 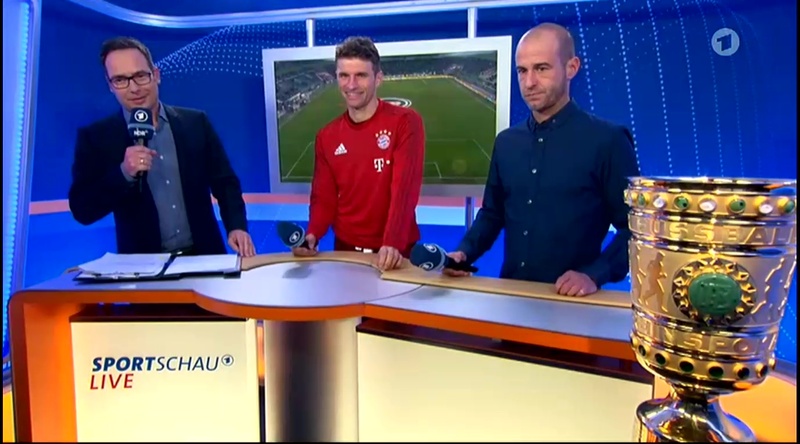 Schwolow was left grasping for the ball, desperately scrambling to get there before either of the Leipzig players did. He succeeds the first time but not the second. Not that it made any difference because the whistle had already gone. Schwolow is protesting for off-side or for a foul on him, anything to spare him the embarrassment of that being a goal I suppose. The replay makes it clear, it’s neither off-side nor a foul of any kind on Schwolow. The linesman however disagrees. I should feel lucky, it’s a decision that went in Freiburg’s favour, and I do feel a little lucky. But mostly I just feel wrong, how anyone could call that one wrong I have no idea. 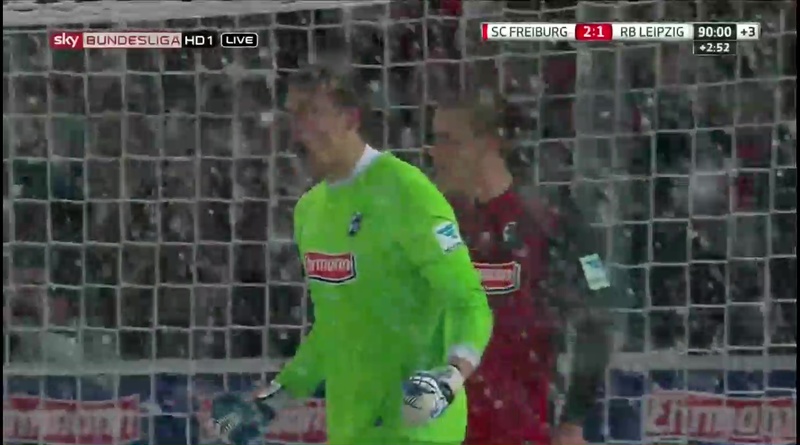 As a result Freiburg went in at half-time 1-0 up, it was not to last. After being bossed around in their own stadium, Leipzig came out flying in the second half and wasted no time in showing Freiburg who was going to be in control for the second half. It took them just over one minute and twenty seconds to get their equaliser. There were two players with Davie Selkie and neither of them could prevent the pass from reaching him or prevent him from taking a shot. His one touch shot left Schwolow helpless, curling right round him, he didn’t see it till it was already heading past him. 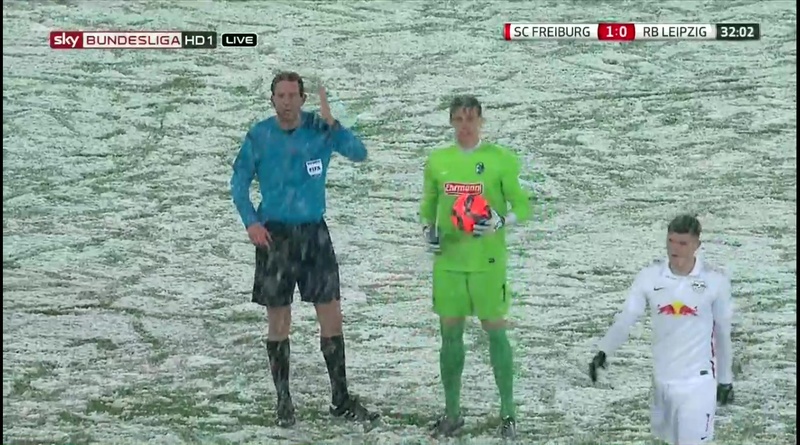 The rest of the second half was a long one, Leipzig now had Freiburg on the run. They kept Schwolow busy with plenty of dangerous looking attempts, him making a particularly important save in the 63rd minute against Davie Selkie. 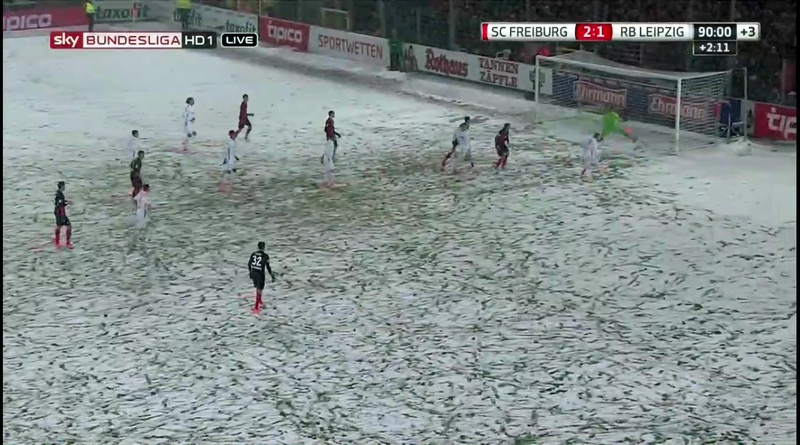 From then on Freiburg didn’t get many more chances and most of the ones they did get were restricted to outside of the box. I was just glad when it was all over. 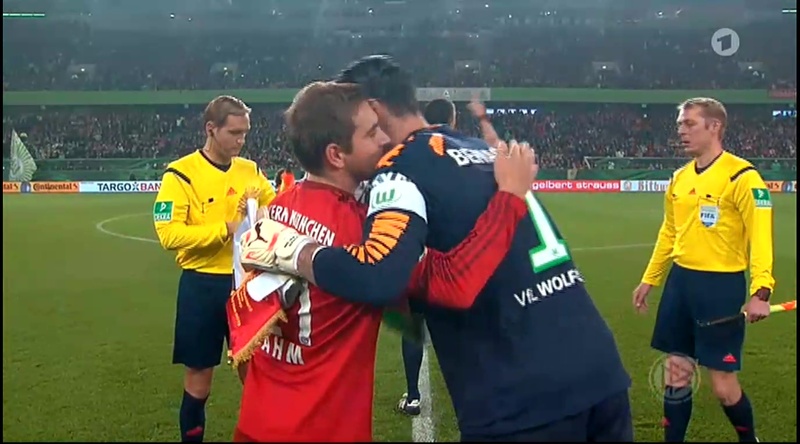 There were quite a few nerve-shredding moments as Leipzig firmly asserted their control over the game and it stayed that way till the very end. 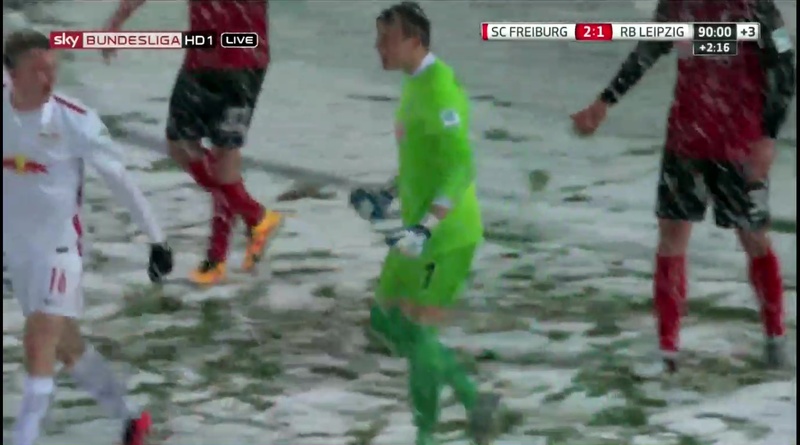 Despite Leipzig’s ever increasing pressure Freiburg managed to hang on to their point and deservedly so, the wrongly ruled off-side goal notwithstanding.